Just like security for your own house, you must be prepared, you must know the environment, and you MUST be proactive. After your house in broken into, it’s a bit too late to purchase a security system. Do you use locks on your front and back doors or do you simply trust your neighborhood? Deadbolts? Do you consider the lighting around your house? All these precautions are PROACTIVE security measures. Do you have insurance just in case someone DOES break into your home? You hope that you will not need it but one MUST plan for this day. PROACTIVE WEB SITE SECURITY is a must in today’s world. More of our sites are created and maintained in the WordPress content management system. WordPress is used more than any other CMS today, which leads to more scrupulous people trying to break into your site and simply mess things up. 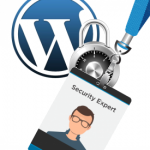 There are powerful tools that must be employed to protect WordPress sites. They all start with highly complicated passwords. More and more online passwords are requiring at least 8 digits, including upper / lower case letters, as well as a number or special symbol ( ! @#$%, etc. ). The latest WordPress version is now requiring even more complexity – How about a password like, ‘ejxdQ%nueh#CSR*LuT6C%cD7‘ or ‘5nv2aM3y!&%JhUkG%‘ ? It would take forever for a hacker to guess this password. Wordfence (Free or Paid version) has tools that can block multiple attempts by hackers. You can set the login parameters, including time outs, IP blocks and even country blocks, as the most likely countries are Russia , US , China , Ukraine , Turkey , France , Korea , India, Brasil, Netherlands. Just as the home owner example above, you have to plan for the day when something happens to your house. If your house is broken into, or if you have a fire, what are your plans. WordPress has various tools that can backup your site. BackupBuddy, UpdraftPlus, BackWPUp, BackupWordPress, Duplicator & VaultPress are the leading backup tools. Sites DO crash, sites are hacked – Plan Before This Happens! In mid-March, the City of Atlanta was hit with a ransomware attack. Several major computer systems that provide city services have been encrypted by an attacker. The attacker demanded $51,000 worth of bitcoin to decrypt the systems, and the city was considering paying the ransom. I think this is a valuable lesson, and something that WordPress site owners should take to heart. It is important to be proactive when it comes to securing your systems and educating yourself about cybersecurity. Don’t wait until you get hacked before you take action.